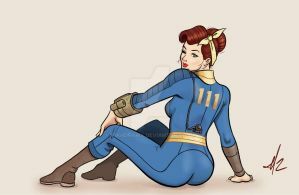 I've been playing Fallout 4 the odd evening after dinner, and I wanted to create a Vault-Girl style Pin up which I named 'Quantum Blue' - a sort of play on Pipers nick name for the sole survivor, as well as the glowing blue of the Nuka Cola Quantum! I've made several versions of this, and I could really feel myself pushing into a stronger style with my Vault-Lady! Here's an older pic of Elder Maxson I made! Check out my Redbubble Shop for Prints and Merch! Help me to grow my youtube channel and check out my art video's! Oh cool! I've been playing it a lot lately, I'm thinking about doing a few more Fallout themed illustrations! I've been playing around with the idea how a pre-ghoul Hancock would look! I'm actually stuck indoors with a hurricane right now, so perfect time for doodles! I didn't know you play Fallout too! Awesome! Those eyes, almost like my last character's. I use Nuka Cola Quantum for ambient lighting in my player homes. Yeah, I love Fallout! I haven't played 4 in a while, but I'm having more fun now its a lot less buggy! I'm thinking of getting some of the DLC for 4, have you played any? Oh I love that idea! I always end up hoarding them because they're so pretty but just stash them in a trunk and forget about them! I started Far Harbor about 2 weeks ago, so my experiences are quite fresh. I'm having much fun with it so far, and didn't even finish the main quest line yet. If you find the Commonwealth too easy, the Island is for you! I haven't played any other DLCs.